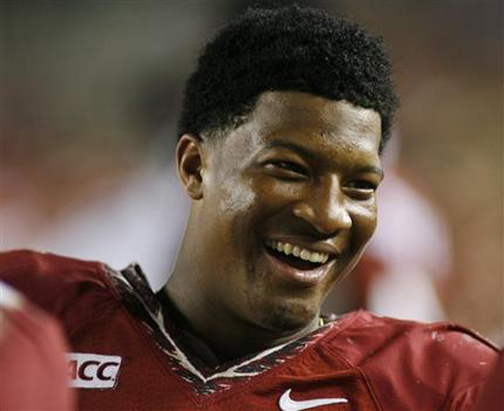 TALLAHASSEE, Fla. (AP) — The family and attorney of the alleged victim in a sexual assault investigation involving Florida State quarterback James Winston on Wednesday sharply criticized Tallahassee police in their first public comments about the case. The lengthy family statement said their attorney, Patricia Carroll, was warned by police that Tallahassee was a "big football town and the victim needs to think long and hard before proceeding against him because she will be raked over the coals and her life will be made miserable." The statement which was first provided to the Tampa Bay Times, also said the woman "cannot fathom" why local prosecutors were not told about the investigation involving Winston until last week. Winston's attorney has repeatedly maintained his client has done nothing wrong. Several city officials — including the interim police chief — held a hastily arranged press conference on Wednesday evening but they refused to respond to the specific allegations made against city police. Tom Coe, the interim police chief, contended that the case was put on hold last February when the accuser "broke off contact" and Carroll "indicated" that the woman "did not want to move forward at that time." Coe, without addressing any specifics, said statements are being made about the case and "some are not factual." "We fully understand there is immense interest in this nationwide case," Coe said. "...My role as police chief is to protect the rights of everyone involved, the integrity of this investigation and to make sure it's conducted fairly and impartially and we try to get the truth in this case." Winston was a top freshman recruit and backup quarterback at the time of the alleged December 2012 assault, but is now a Heisman Trophy candidate and the Seminoles are the second-ranked football team in the country. The family said in their statement that the woman did not initially know the identity of who assaulted her and did not identify the alleged attacker as Winston until January. Carroll, in an interview with The Associated Press, disputed the assertion by City Manager Anita Favors Thompson and Coe that the investigation into the alleged assault was put on hold because the woman no longer wanted to prosecute. Favors Thompson, saying that she anticipated national media interest because of Winston's celebrity, emailed that information to the Tallahassee mayor and city commissioners on Nov. 12. Her email stated police "stopped getting responses from the young woman and could no longer contact her for additional follow up and information after many attempts to do so. The city manager said an attorney representing the alleged victim's family said she "changed her mind and did not wish to prosecute." Carroll, however, said that the woman never told police she did not want to press charges. Carroll said that the accuser — who is from the Tampa Bay area — was going ahead with her life and attending classes at FSU when it became apparent that the police had no plans to seriously investigate the case. She left school last week when she learned that the case was about to become public. "I had no faith whatsoever in the Tallahassee police department," said Carroll. The statement from the family said that Carroll asked Tallahassee police detective Scott Angulo about obtaining a DNA sample from Winston. But Angulo refused to get the sample and refused to interview people— including Winston's roommate — who may have witnessed the attack. The family said the detective told Carroll that "such activity would alert Winston and the matter would go public." When officials were asked about the allegations, TPD spokesman David Northway said they couldn't comment because it is an ongoing investigation. The family statement also disputed that the woman was "intoxicated" at the time of the incident, saying that blood work showed otherwise. Carroll said the woman and the family are cooperating with prosecutors "as they proceed with whatever actions they are taking in this matter." Tallahassee police handed over information to prosecutors about the 11-month old case after two media organizations began requesting records associated with the incident. State Attorney Willie Meggs has said his office may make a decision regarding the case within the next few weeks. Timothy Jansen, Winston's attorney, has said his client has done nothing wrong and maintains he will be exonerated. Jansen has said that he was told in February by police that the case was closed. Coe emphatically said "the case was never closed," saying it was classified as "inactive" but still open. Coe said that after the media requests police consulted with Meggs and that the case was then "reactivated." The family, in its statement, said the woman was "devastated" when they heard that Jansen was told about the case last February. They said that allowed Winston to create his defense and prepare witnesses. Jansen said Wednesday he would not respond to any "specific aspects" of the investigation mentioned in the family statement. "We are waiting, like everyone else, for the decision from the state attorney's office," Jansen said.